The Personal Ordinariate of the Chair of St. Peter was established (In accordance with the 2009 Apostolic Constitution of Pope Benedict XVI, Anglicanorum cœtibus,) in response to repeated and persistent inquiries from Anglicans who over time, have come to identify the Catholic Church as their true home. Those joining the Ordinariate have discerned they are truly Catholic in what they believe and therefore desire full membership in the Catholic Church. There are three Personal Ordinariates (Our Lady of Walsingham in the United Kingdom; the Chair of Saint Peter in Canada and the United States; and Our Lady of the Southern Cross in Australia) which were created to provide a path for groups of Anglicans to become fully Roman Catholic, while retaining elements of their worship traditions and spiritual heritage in their union with the Catholic Church. The Ordinariate is a key ecumenical venture exemplifying the Second Vatican Council’s vision for Christian unity, in which diverse expressions of one faith are joined together in the Church. In the Second Vatican Council’s Decree on Ecumenism (Unitatis redintegatio), the Catholic Church specified what it would look like to bring all Christians together into full communion. The Council said Christian groups would bring their own distinctive traditions to the Catholic Church; they would not be suppressed or absorbed. The Vatican’s remarkable ecumenical gesture in establishing the Ordinariates affirms the Catholic Church’s view that the patrimony of differing Christian spiritualities and liturgies is a treasure meant to be shared within the Catholic tradition. The Personal Ordinariate of the Chair of St. Peter is equivalent to a diocese and was created by the Vatican in 2012 for those nurtured in the Anglican tradition who wish to become Catholic. Founded to serve Roman Catholics across the U.S. and Canada, it is the first diocese of its kind in North America. Based in Houston, Texas, this Ordinariate has more than 40 Roman Catholic parishes and communities across the United States and Canada. St. John the Baptist Deanery was created to address the particular needs of the Canadian members of the Ordinariate. Called to be gracious instruments of Christian unity, members of the Personal Ordinariate of the Chair of St. Peter are led by a bishop who was appointed by Pope Francis. Bishop Steven J. Lopes is the first bishop of the Personal Ordinariate of the Chair of St. Peter. 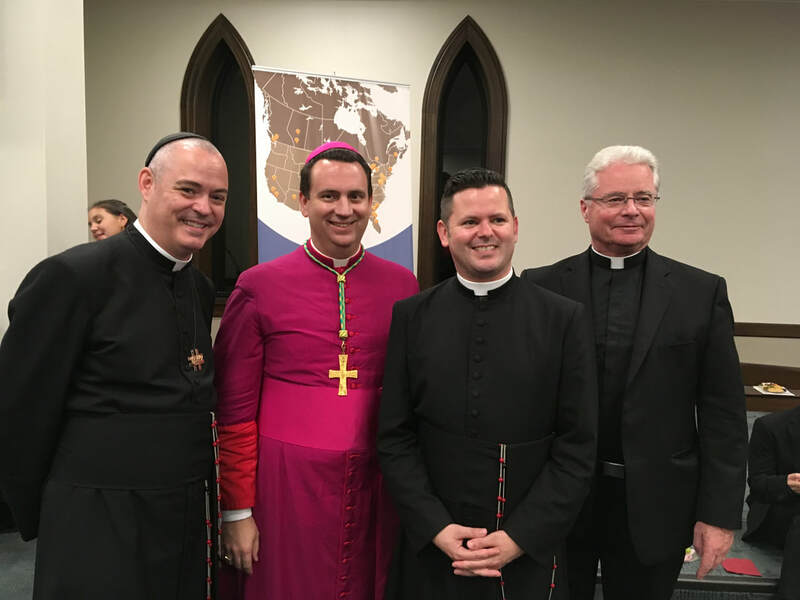 Like other bishops in Canada and the United States, the bishop serves under the direct authority of the Pope to build up the Catholic Church through mutual mission and ministry. The bishop is a full member of Canadian Conference of Catholic Bishops as well as the United States Conference of Catholic Bishops. The Deanery of St. John the Baptist was established on 7 December 2012 to serve the first eleven Canadian Ordinariate communities. Msgr. Jeffrey Steenson, Ordinary of the Ordinariate of the Chair of St. Peter at the time, appointed Fr. Lee Kenyon as the first Dean of the Deanery. With Fr. Kenyon's return to England on 29 June 2017, the Very Rev'd Carl Reid was appointed as the new Dean. Since that time, the Canadian Deanery has been officially incorporated and has attained CRA Charity Recognition. The Officers are Very Rev. Carl Reid VF (Chair of the Board), Very Rev. Timothy Perkins VG (Vice-Chair of the Board), Ms. Deborah Gyapong (Secretary) and Mr. Bruce Travis (Treasurer). In addition to the above Officers who are also appointed Directors, we welcome Mr. Mario Josipovic as a Director of the Board. Congratulations: Brothers Bengry and Beahen were ordained to the priesthood on Friday 29 June 2018 at the Cathedral of Our Lady of Walsingham, Houston, Texas. Fr Robert-Charles Bengry is now the Parish Priest and Fr Sean-Patrick Beahen is the Parochial Vicar at St. John the Evangelist in Calgary. Come Home: Is God calling you home to the Catholic Church? If you are an Anglican parish or group interested in joining the Ordinariate corporately, your rector or priest needs to begin the process by identifying your parish to the Vicar General of the Personal Ordinariate of the Chair of St. Peter. You may contact the Vicar General, Very Rev. Timothy Perkins, at vg@ordinariate.net. Priestly Vocations: For the Seminary Formation Fund, funds donated and collect in Canada stays in Canada. Please pray for Canadian vocations to the Priesthood and to the Religious life and support this important ministry. Support the Bishop’s Appeal: The Bishop’s Appeal provides essential support for the Personal Ordinariate of the Chair of Saint Peter’s core mission of evangelisation. Through this annual appeal, you can provide for services and programs that will widen the Ordinariate’s ministry to those who seek full communion with the Catholic Church, and to those within the Church whose faith has grown lukewarm. Gifts to the Bishop’s Appeal support ministries that cannot be accomplished by one Parish alone. Together, we can meet the needs of our growing Ordinariate!